Jeanne Moyer is an occasional writer, blogger and subject of articles on green homes, energy efficiency and sustainability. Full of green energy: finding your perfect home on the 3rd annual green home tour, published in the June/July 2008 of FootPrint EcoMagazine. The Business of Green, published March 27, 2009 in the News and Observer. 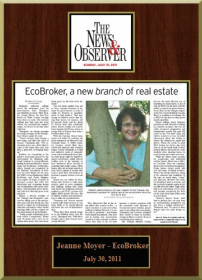 EcoBroker, a new branch of real estate, published on July 30, 2011 by the News and Observer.